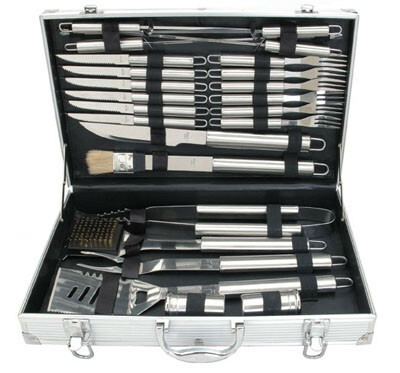 The BlueTongue 24 Piece BBQ Tool Kit is packaged in an aluminum carrying case. The tools are made from a commercial grade stainless steel and are dishwasher safe. This 24 Piece BBQ Tool Set is packaged in an aluminum carrying case. The tools are made from a commercial grade stainless steel and are dishwasher safe. This is a sensational kit and would make the perfect present for the "chef de cuisine"